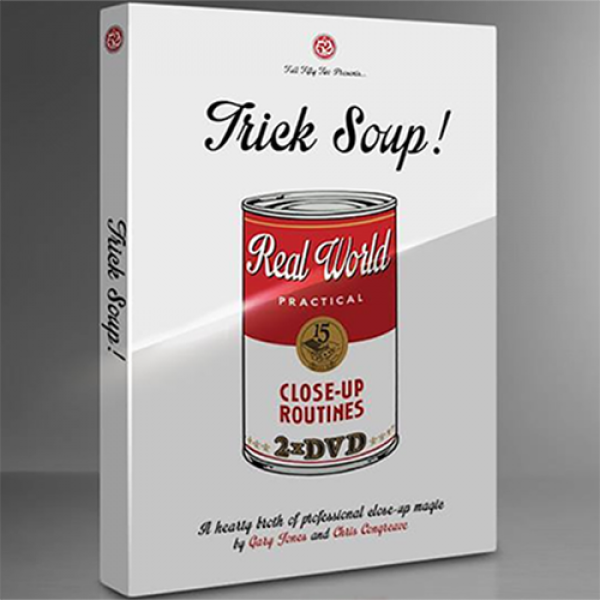 Trick Soup with Gary Jones and Chris Congreave. Double disk DVD! Gary Jones and Chris Congreave (Automata) return to Full 52 with Trick Soup! A double DVD set featuring FIFTEEN practical, professional-grade close-up routines for workers in the REAL WORLD! If you've ever wondered what type of material fills the repertoires of busy, full-time working professionals -- look no further! This project was specifically designed to cut through the pipe-dreams and 'magic for magicians' and get right down to the nitty-gritty effects. These are the ones that have allowed these two pro's to make their living in the game for more years than either of them might care to mention! Marvel at the misdirection, be tricked by the technique and stunned by the sleight of hand! This double DVD box set may well be all you'll ever need to make a living in the real world of professional close-up magic! Back Palm Thank You Mam! - Jones at his finest. It's going straight into your repertoire! Over-drawn - Chris's super-commercial bill switch routine that instantly re-sets! Pro C.U.B - Gary Jones's professional 'Card Under Box' will leave your jaw on the floor! Win a Watch - Gary's card under watch routine - funny and practical! Coins Across - Chris offers his own take on this table-hopping classic! Interlace - Gary's version of this card classic WILL FOOL YOU! Jazz Routine - Chris's non-stop, fast and furious 'jazz' routine! Not Chosen - You'll be making up this 'one-trick-deck' of Gary's for sure! Joke Box - Chris's 'under the box' transpo - in THEIR hands! No Sleep - Gary's lightning fast 'four-for-one' transpo is a SHOW STOPPER! Most Likely - Chris presents a KILLER card-to-pocket transpo! Twenty One Again - Gary's 'thought-of-card-to-pocket'... with a surprise ending! Sign Post - Chris's impromptu 'Anniversary Waltz' is as smart as they come! Blackjack Surprise - Chris's commercial Blackjack routine with a 'card-to-wallet' finale! Solidified - Gary's 'solid deck' routine will leave you IN AWE! It's almost TOO MUCH MAGIC! As you can see from the above, there are marvelous ingredients in this package. Trick Soup -- you'll love it!